Let me start this article to capture the road conditions from Delhi to Spiti valley via Shimla – Kinnaur Valley. A lot of people travel to Spiti Valley via Kinnaur route every year. Some who travel from Kinnaur Valley exit via Kaza to Manali route. But, for this article I will focus on the road status and conditions from Delhi to Shimla to Kinnaur to Spiti Valley. The article will help you get updated road conditions and status before planning a trip to Spiti Valley in Himachal Pradesh. Is road to Spiti Valley open in Winters? When you travel from Shimla to Kaza or Spiti via Kinnaur, you traverse the route along Hindustan – Tibet Highway or commonly known NH-05 (previously known as NH-22). The Hindustan Tibet Road is also known as the world’s most treacherous roads and when you travel on it, you will get to understand the reason why. This road to Spiti Valley runs through some of the beautiful places well known as Shimla, Narkanda, Kufri, Kinnaur, Tabo etc. Well, the words are short to explain the entire experience. But I can share the road conditions for all those who are planning a trip to Spiti Valley in this article. For everyone else, this article may also act as a reference for the entire route between Delhi to Shimla to Kaza, Spiti Valley via Kinnaur. Here is the general breakdown of major sections of Hindustan – Tibet Road or road to Spiti Valley. Delhi to Shimla remains open all around the year. Then further as you move from Shimla towards Narkanda, the road might close at Kurfi and Narkanda in winters due to heavy snowfall. However, after Narkanda to Reckong Peo in Kinnaur, the route remains open mostly as regions in between does not receive heavy snowfall. Although on some days, the road to Reckong Peo from the diversion point of Hindustan – Tibet road might close for a day or two. Beyond Reckong Peo, next bottleneck point of road closure can be multiple, starting from Akpa – Jangi – Spillow. The major one, of course, being Nako – Maling Nala – Chango road which may close due to furious Maling or landslide at Maling Nalla. Finally, if you are able to reach Tabo, you are already in Spiti Valley. The main extreme winter zone starts after Tabo at Schichiling, just below Dhankar. From here onward, in winters, the rod to Kaza may remain closed for some days to weeks due to presence of heavy snow. I think it makes sense to keep the road status within Kinnaur Valley updated as well. Most people traveling to Spiti Valley, also visit Kinnaur and explore places like Sangla, Chitkul, Kalpa and Sarahan. Hence, knowing the road status of these routes will also help you plan the visit to these places in Kinnaur Valley as well. I hope these road status for Kinnaur Valley and Spiti Valley will help you in your upcoming trip. In case, you have an update on it. please share with me in comments section or DM me on Instagram. The road conditions on this route running along NH-05 or Hindustan – Tibet Road from Delhi to Spiti Valley remain similar majority of the year. It does not change much in the year except in monsoon and winter. Monsoon is not a good time to be in Kinnaur Valley due to fragile mountains. Landslides are pretty common and slush makes equally difficult to drive in such a terrain. And in winter months, you should be careful as some parts on this route around Narkanda, Kufri, Nako, Reckong Peo, Tabo receive a heavy amount of snowfall closing the roads for some days to weeks. In March – April, the snow melts and that’s when shooting stones and snow slides are also a common phenomenon. I will try my best to keep this thread with updated road conditions from Shimla to Kinnaur to Kaza, Spiti Valley. You should also read about the best time to visit Kinnaur and Spiti Valley. 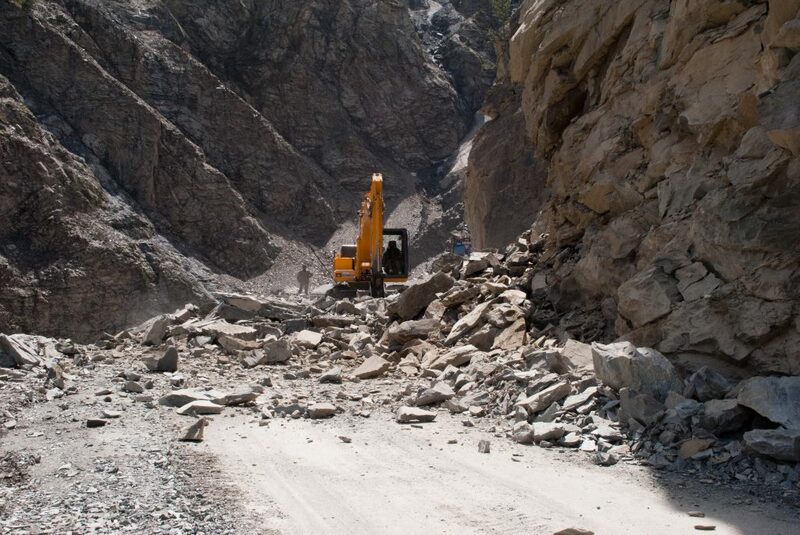 Here is the jest of road conditions of Delhi – Kinnaur – Spiti route in 2019. In case, you have an update, please feel free to post it and I will be happy to update the status. Yes, the road to Spiti Valley from Shimla – Kinnaur side remains open all round the year including winter months because there is no high mountain pass that gets closed. However, the road closure is common for few days to weeks in case of very heavy snowfall days. The snowfall gets so heavy in few days of winter that it takes time to open the road between Reckong Peo and Kaza especially between Nako – Tabo – Kaza. 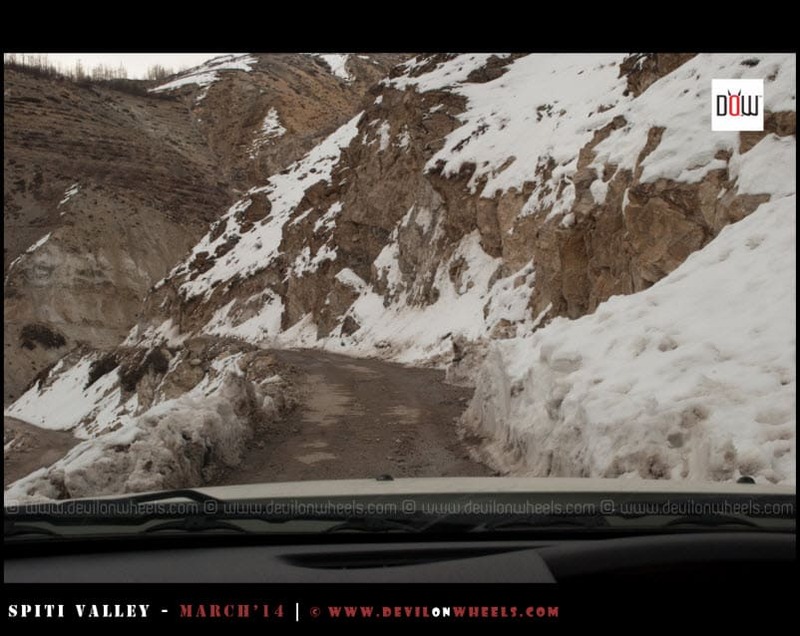 Hence, when you plan a trip to Spiti Valley in winter, please keep the buffer days in hand. I hope this article will be useful for someone who is planning a trip to Spiti or Kinnaur in near future. Please feel free to ask any questions/doubts you have and I would be happy to revert back. If you happen to know the more updated road conditions, do let me know and I will update the required section. If you know your friends or family are planning a trip to Spiti Valley from Shimla – Kinnaur route, do share this article with them to help them make a memorable trip. Thanks for the article on spiti Valley. Can you please advise if we can get the pure veg and jain food for the entire trip from Chandigarh to Spiti Valley and back to chandigarh. Your early reply will be appreciated. If you feel no can we plan our trip to only Kinnaur valley. Pl guide us. We have planned to run the Sangla half marathon from Batseri this year and have to be in Sangla by 30th April 2019. Thinking of making a road trip out of this because we have not yet visited Sangla / Chitkul and beyond. 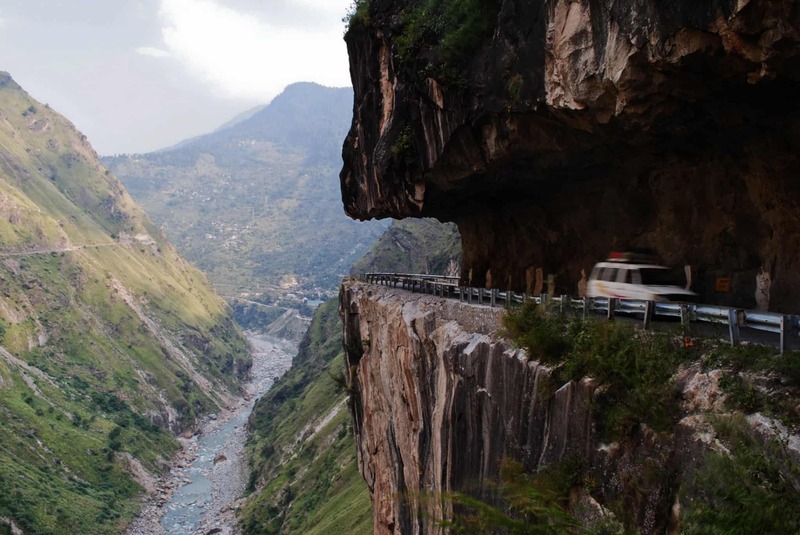 (Have done Spiti road trips etc 6-7 times before from both Shimla/ Manali sides). Will obviously be doing the Shimla route now. 1. Would be grateful if we could get some idea about the road conditions till Chitkul as of now because we have about 2 weeks to go before we start from Pune. I have a Fortuner AT vehicle (It is not a 4×4). 2. Does one need a permit to drive beyond Chitkul to the ITBP post (subject to the roads being opened up till then) ? I am planning to visit Kaza via Shimla with my friends around 20th March 2019. We’ll be travelling in a Santro xing and a Ritz. Is it safe to go there? And do you think we should carry chains? 1) first, whether March is a good season to travel by road ? 2) based on the latest updates and your network, whether we will reach Kinnaur valley ? What are the chances of road blockage ? 3) what are the chances of snow melt affecting road trip after 20th March based on previous year experiences ? I look forward for your expert advise. How are conditions now on the Hindustan-Tibet Highway? I am planning a solo motorcycle trip starting 7th Sep. Hopefully conditions should be better by then? Have the rains eased out? As of now it seems like, no reports yet of bad weather from any parts. Thank you Mr Dheeraj. We will consider canceling. My husband and I (both in late fifties) are planning a Spiti trip starting from Shimla on the 1st of September. We plan to travel in an Innova. Can you help me with any update about the road conditions? The erratic rains seem to have made it unsafe this year. Should we continue or postpone our trip. As there is heavy rainfall predictions in coming days and alert has been issued in Himachal and Uttarakhand, I will recommend that you go postpone it by a week or so. I am planning a visit to spiti valley from Shimla side and exit from Manali covering all major landmarks including chandrataal. Is it safe now to go and are the bus routes also open? Rishu, as of now Himachal is not safe to travel with all the rains going on. I will suggest that you postpone the trip by a week or two. Thank you Dang, looking forward to it. Delhi – shimla / kinnaur – spiti. The same route you mentioned in this post. We will strt on 17 th/ 18 th dec. is this time of year ok to travel this side. Also how many days would you suggest if we plan to stop at shogi. Then 2 -3 more places so tht we can enjoy the complete road trip. Apart from this is audi q3 ok for this route? Thnks! No this is not the right time for a trip to Kinnaur Valley or Spiti Valley unless you are OK with extreme harsh conditions of winters and cold beyond Kinnaur, OK with washrooms with no water, OK with very basic food and OK with very basic stay. On top of it, in case it snows and you are in Spiti, the chances of getting stuck for a couple days to week is possibility. Thnks!! If we go till kalpa? We are not planning to go beyond that. Spoke to one of the hotels there and as per them the roads will be clear and it shouldnt be much of a problem till there. Also we are ok with harsh winters. Hope the road conditions are ok to drive down. Thnks! Best wishes for the trip, keep a tab on weather updates. It gets ugly at time up there, so be prepared, mentally. Upto Kinnaur it is fine but then you start ascending yourself into high altitude zone where the trouble starts. Key is to travel slow and gradually increase the altitude. Raman, if you are getting some Xylo or Scropio, better prefer that in front of Innova. Though with experienced hands behind the wheel, innova will not face any issues too. Nitin, there are few bad patches of slush and all after Bhawanagar but it is manageable by sedans as well if driven carefully. Dear Dheeraj, Seems I had to find you some day and you are my light on this journey. I am planing for Delhi Kunzum pass via Shimla. I want to do the treking to Chandrataal Lake. I may extend to Rohtang Pass. I have Beat Petrol. Can i manage this journey with by car and what will be the best time to do this journey? Please guide. You can go all the way upto Kaza Aman bhai 🙂 … Roads are open all round the year barring few days of heavy snowfall which might get you stuck until clearance for a day or two anywhere beyond Narkanda. so, if you do not have anything important to handle back at home and are OK with very cold conditions, then you may go all the way to Kaza. 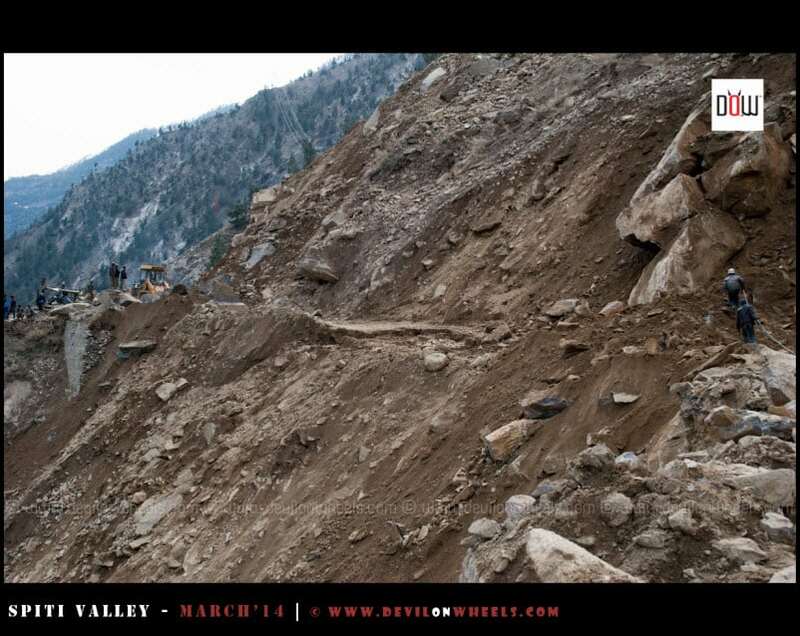 Do not go anywhere inside or diverted from main highway because those roads can get blocked for more time and are not often cleared until next season, like Pin Valley. Hello. Please give your comment If I can visit in my wagon R to pin valley in October. Yes, you can visit Pin Valley in Wagon R buddy. I have done it in my dZire without much of an issue. Sorry for the delayed reply, I was traveling Zanskar Valley for past 9-10 days and was away from network. No, there aren’t any turns that would confuse you. The road leads you all the way straight to Kaza. Just keep following th road signs for Kaurik and once you reach Sumdo, there will be a Y-Fork where straight road (main one) will lead you to Tabo – Kaza and left uphill will take you to Kaurik where any civilian is not allowed. So, keep following the main highway. Thanks dheeraj.l m planing d trip in mid september. I hope new malling route is better ?? Any more worst spots on this rt,other then malling??? FOR DZIRE.,???? As you see the above road conditions, they tend to be very similar through out the year. Most troublesome spot is Malling only but now if you are considering Pin Valley, then again you might face few more due to recent mud slides in there. After Powari roads are real bad upto Akpa bridge. Rest as you see, my dzire rocked and so will yours but do drive carefully. I m planing delhi-kaza via shimla in september in swift dzire.is it ok for roads on this route ??? You cannot by pass Malling Nala friend. There was a old Malling Nala and the route through it has been closed now. The new route is now at more altitude and even this one does poses a problem or two every now and then. When are you planning for the trip?